Rejuvenate disinfectant ready-to-use spray and wipes. Winners will receive two disinfecting cleaner wipes, and one ready-to-use disinfecting cleaner spray from Virox ProBeauty. Rejuvenate disinfectant cleaners are powerful but safer for you! Rejuvenate disinfectant cleaners are specifically designed for spas and salons, using an accelerated hydrogen peroxide formulation that is EPA approved, tough on germs, yet safe for you and the environment. 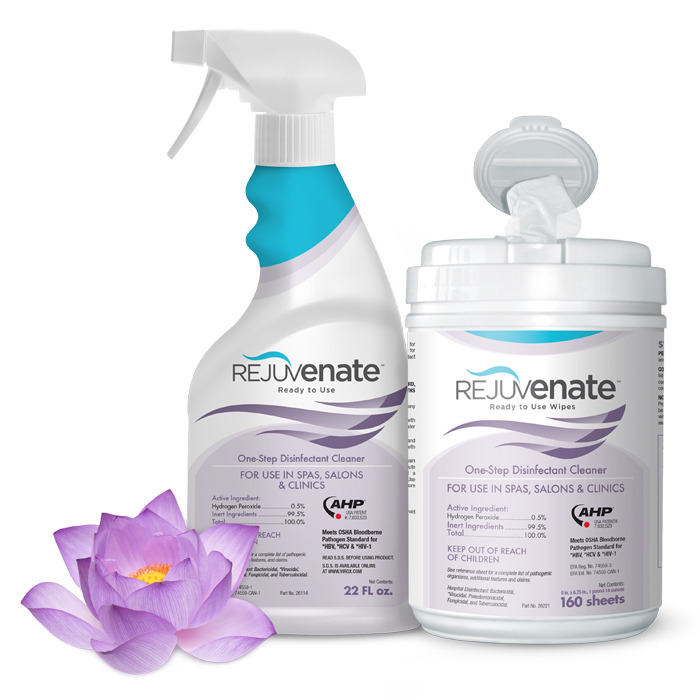 The rejuvenate product intro kit contains two canisters of rejuvenate wipes and one spray bottle of rejuvenate ready-to-use disinfectant cleaner. I would like to enter this sweepstakes. I confirm that I am a legal resident of the United States, including the District of Columbia, who is 18 years of age or older as of the date of entry. I am also NOT an employee of Creative Age Communications, Inc. or an immediate family member (parents, siblings, children and spouse, and person residing in the same household whether related or not) of a Creative Age Communications, Inc. employee. I am also NOT an employee or an immediate family member (parents, siblings, children and spouse, and person residing in the same household whether related or not) of the sponsors, their affiliates and their advertising, promotional or other agents. The contest ends on July 11th, 2018.